How to Properly Care For Your Trees | Mr. Tree, Inc. Homeowners who have trees on their property need to take various steps to ensure they remain in good health. One aspect about trees is they can be young, mature, or recently planted. A few tips can be used to ensure proper tree care is provided for any trees on a property. Contact a local tree service if a tree is beginning to turn brown or may seem to have a health issue. Staking trees is often done with newly planted trees or transplanted trees to help develop root systems. However, tree staking that is done improperly causes a tree to not develop a good support. This can result in a tree growing taller, but not growing a wider trunk. The best thing for a homeowner to do is remove the stakes after one full year of growth. Updating a landscape often means transplanting one or more trees. Moving a tree many also be needed if they may soon outgrow a specific area. Many times transplanting any larger trees will require the help of a local tree service professional. Small trees in a yard will take about one hour to dig up and replant. A younger tree will be much easier to move than a larger tree. One thing to keep in mind is to avoid trees with leaves as the shock of a transplant can cause serious damage. Add much once a tree is replanted. The best thing for a homeowner to do for a young tree is apply mulch. Mulch has nutrients that provide improved moisture availability, temperature, oxygen levels, and soil structure. One of the main aspects of mulch is giving a landscape a well-groomed appearance. Mulch comes in many types and colors for any type of landscape. Another advantages of mulch is it can often prevent weed growth. The depth of the mulch should be no more than two to four inches. Young trees, recently planted trees, and transplanted trees will benefit from applying fertilizer. The use of fertilizer will help a tree grow and develop a healthy root system. Fertilizing is a task that should be done at different times throughout the year. The best times to apply fertilizer to trees is in the spring or early summer. Light applications can be added once a month as trees get older. Late march to the first part of June is the best time to apply fertilizer for proper tree care. Pruning trees needs to be done as they begin to grow and mature. The purpose tree pruning is to have a desirable form and strong structure. 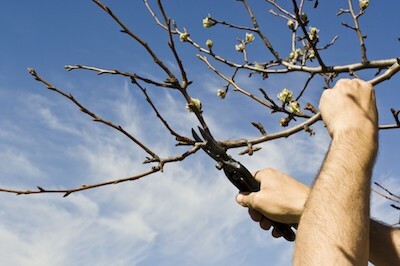 There are many methods that can be used to prune trees. One thing to keep in mind is to obtain the right tools for the job. This means having a standard set of pruning shears which can be found at a local home improvement store. Start by removing dead limbs and limbs which seem to be weak as thing will improve the health of the tree.